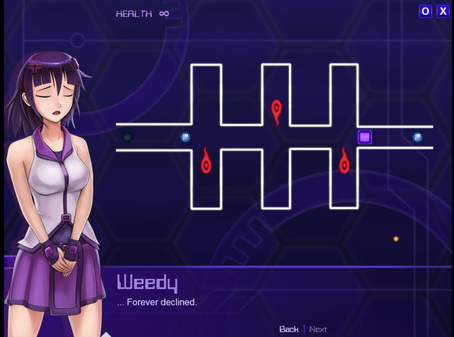 "Unhack" is a hybrid game that mixes in elements from the puzzle and visual novel genres. In this game you play as a character named Unhacker, his job is to fix up systems that have been hacked. Unhacker isn't alone on his journey as he is joined by some beautiful A.I. (artificial intelligence) women named Weedy and Miss Debug. The story in this game has Unhacker being put in charge of a job of trying to take out a devastating virus named the "5K Worm" that is set to destroy a lot of valuable data. This is a tough task for sure and the task gets tougher when you hop into cyberspace as you'll see that this game isn't a simple case of repairing data as there will be obstacles hell bent on stopping you. 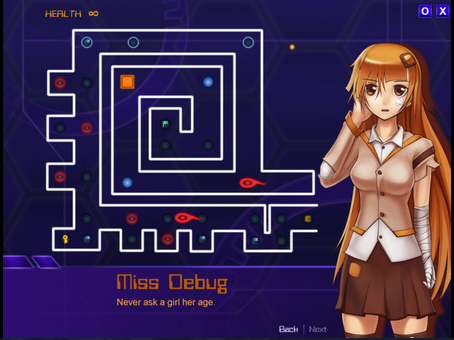 Can Unhacker, Weedy, and Miss Debug put an end to this killer worm? For the power of unhacking is at your fingertips in Unhack. (Click "Read More" to read the full review). The story in this game is very basic, easy to follow, and was also very entertaining. The story does start off a bit weak though but it does get better as it goes along and the drama became more intense and better written. The way this game plays has you maneuvering a dot though a maze via traveling from dot to dot (oh yeah, dot on dot action) and when you touch certain dots you'll activate an event in a form of a cut scene. The cut scenes are in a visual novel style and they blended in very well with the maze styled gameplay. You are not forced to watch most of the scenes (excluding intermission segments) so you can keep playing if you are not interested in the cut scenes. So this game is a mixture of visual novel and puzzle and they worked together pretty well as it had charm but if this was a straight up puzzle game or visual novel game it wouldn't work as well. It is very nice to see some experimentation pay off. Controls are very simple as you can either use the W, A, S, D keys to travel or you can just use the mouse and click the dot you want to travel to. This game has three difficulty settings which are called: Normal, Hard, and Insane. Normal difficulty is incredibly easy to play through and you will not get any challenge from it what so ever but it is a great mode to play if you want to playthrough to see the story unfold. Once I beat the game I skipped over hard mode and went straight for insane mode. After being a little disappointed by the challenge level of normal mode I was expecting this to be the same but without unlimited lives... I was wrong. Difficulty in this mode beefs up the game a whole load more and it got to a point where it made me want to pull out my hair out. I sadly could not beat the game on this mode and heck, I could beat a few of them and just by a single hair. Brutal mode is great for once you have seen the story and just want to play the game for the gameplay. This game is also pretty short as there are only ten chapters/levels and it can be beat in an hour or two on normal mode. Brutal mode will take you longer (obviously) and that's including skipping over the cut-scenes. Graphics in this game have some very nice and very beautiful characters that are designed very well. Graphics of the mazes are alright although nothing special but they get the job done. The soundtrack in this game suited the game very well and helped build an atmosphere that'll set you in the mood. An MP3 version of the soundtrack is also available as free DLC if you want to listen to the tracks outside of the game. This game does have voice acting and I really enjoyed it as it had voices that worked well with the characters and the acting was very decent too and it sounded very professional overall. The dialog in this game was decent and did tell the story well but I did find the main character (Unhacker) to have some annoying lines every now and then but I also didn't hate it at the same time as they got the whole "stereotypical childish hacker" attitude just right. One thing I disliked at first but grew to love was Miss Debug's catchphrase (not going to spoil it as you'll know it when you see it) as when I first heard it I got a little annoyed and a bit more the second time but then it grew on me when I got to know the character more and then it became cute and charming. Now for a bonus mini-review. This game does have an expansion pack available in the DLC section of the store page. The expansion set is called "Unhack: Destruction" and it adds in a new story mode that takes the point of view from your rival anti-virus company. The story in this expansion pack was surprisingly very strong and filled in some holes left in the original game. This story in this expansion messed with my emotions a little bit as there was a tragic scene that made me feel a little sad (not crying out loud with tears or anything but it did make me feel some sadness nonetheless) and that's rare for me when it comes video game. Characters were very good and very interesting plus it changes the way you think of the characters found in the main game. Puzzles in this game started off a bit slow but soon grew to be decent. This expansion pack is worth checking out but please do so after you've played the main game as it'll be much stronger that way. One concern about this game is that even though I'm giving this game praise as this game will only appeal to a niche crowd. With that said this is a game you are either going to really enjoy it (like me) or just not care for it as this really isn't a game you'll find yourself hating even if it doesn't click with you. Overall I actually didn't think that I was going to care for this game as much as I did but I ended up really enjoying it and even more so with the Destruction expansion pack added on. Don't be afraid to give this game a go.